• Luck’s confident, as are the Colts, that he won’t need more surgery on his shoulder. 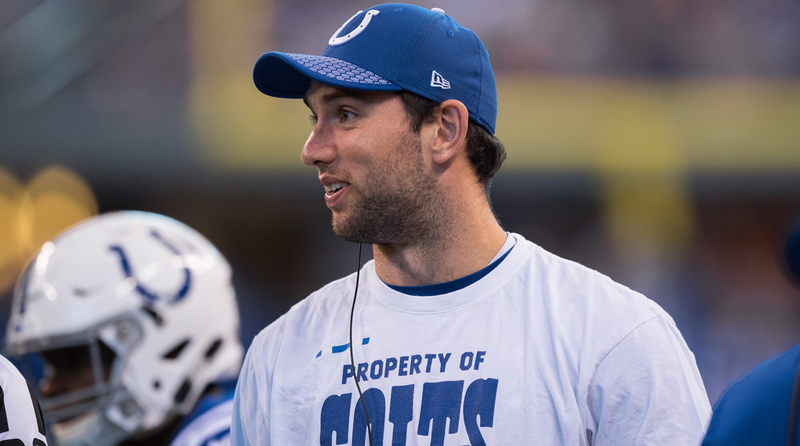 “That is not an option for me right now,” Luck told me. “That ship has sailed.” Luck is in California. I talked to him via FaceTime, and he’s working with mechanics doctors Tom House and Adam Dedeaux on throwing mechanics before he cuts loose with the football. House seems confident that Luck will be able to throw without restriction this spring, in Colts’ minicamp practices. If he can’t, that’s going to be worrisome for the Colts, who still consider Luck a franchise quarterback though he has missed 28 of 48 games in the last three seasons. Worrisome would be putting it mildly. Luck, who had surgery for a torn labrum in mid-January 2017, kept getting shut down last year and still hasn’t commenced throwing full speed in California. ”I’m in the middle of a little bit of throwing,” Luck said from California, where he is rehabbing and training. Watching Luck, and listening to him, it was clear he feels confident he’ll be ready to roll when Colts practices begin in April under new coach Frank Reich. • The fact that Luck is not throwing freely 13 months after surgery is concerning, but the Colts believe it’s a matter of time before he throws consistently well. The delay in throwing consistently, the Colts think, is likely because he played so long with pain in his shoulder before having surgery. Too many orthopedic experts, plus House, have told the Colts that Luck is on course to be throwing normally in training camp. So there’s not significant worry inside the team. The Colts expect Luck to be fine come July. • Frank Reich could have come from being a JV coach in some Indiana high school, and it would have been fine with Hoosiers. Anyone but Josh McDaniels. When I talked about the Patriots at this Colts event, this crowd of a few hundred hissed and booed. The big takeaway for me at this event was that the Colts might have gotten their third choice (after McDaniels and Mike Vrabel, who went to Tennessee as head coach), but the fans are thrilled that Reich’s the man. • Reich has one thing the Colts didn’t know he had: the ability to take command of a room. The former Eagles’ offensive coordinator had the reputation of a bookish guy, sort of a Tony Dungy type. But GM Chris Ballard found that, like Dungy, Reich has the ability in his own way to stand in front of a group of people and get their attention. “It took me about 15 minutes to see that,” said Ballard, about his first interview with Reich on Feb. 9. That will be an interesting thing to follow once the players report in April. This is a team that’s been beaten down by losing, and it’s in a division that suddenly isn’t a pushover. So Reich could have to coach through some losing times before the Colts are good enough to win. One last thing: I met defensive coordinator Matt Eberflus for the first time Tuesday night. He’s the assistant that McDaniels wanted as his coordinator, and the Colts hired on faith in January. When McDaniels told the Colts he didn’t want the job on Feb. 6, the Colts already had signed Eberflus to a contract. So he stayed, and when Reich came aboard, there was an awkward situation—Reich essentially had to keep Eberflus. And Reich did, and he told me he was very happy with him. Eberflus told me he held no hard feelings toward McDaniels after McDaniels got him to move from Dallas to Indy, and then left him hanging with the Colts when McDaniels relinquished the job. He might not, but I can tell you, this crowd certainly did. And will, going forward. All true. Here’s the way I look at it: Let’s just say I’m right, and Drew Brees, Case Keenum, Kirk Cousins and A.J. McCarron all sign elsewhere. And let’s say you’re Cleveland GM John Dorsey, and you now have to choose among the remaining players on the street for a veteran quarterback he certainly intends to import. Your choices: Explore paying a ransom for Nick Foles; or sign Tyrod Taylor, Teddy Bridgewater, Chase Daniel or Bradford in free agency. The alternatives are not good. In no way am I saying you sign Bradford as your solution at the position—you sign him as the bridge to your highly drafted quarterback in April. My understanding is the NFL attempted to speak with Hurney’s ex-wife and she declined the chance to press her case with the league. And the rest of the case was not deemed serious enough to pursue. The NFL has had enough missteps in the area of harassment and domestic-abuse cases that I doubt they would dismiss this without investigating the story. The NFL knows the downside to missing on these cases is significant. Rich, Eli Manning has been a different breed his entire life, and I mean that in a very complimentary way. Being a good person with interests outside of football has always been important to him. Being a great dad has always been important to him. I am sure some of this has to do with the family part of it, with his family being happy in their New Jersey community and Manning not wanting to uproot them for an uncertain year or two or three, and perhaps another move before he retires. I also don’t know what the market would have been for him. And who is to say in April, when Team X with a big quarterback need is disappointed in what free agency yielded that the GM of Team X wouldn’t call the Giants seeing if they might be interested—with a specific ask being put to Manning—in a deal? I included teams that have discussed looking for a long-term quarterback in the last year or so. The Chargers and Giants have done that; the Steelers have not. Club chairman Art Rooney II, in fact, said this month that Roethlisberger told him he’d like to play beyond the 2019 season, when his contract is due to expire. So I view the Steelers as a QB-buyer maybe in the 2019 or 2020 draft more than this year. Joe, thanks for the kind words. The Packers might be looking for a good backup, as many teams will be doing this off-season. But they’re not looking for a starter anytime soon. My list might have been 28 teams long if I included the teams trying to buttress their backup situations too. You’re right about that—Dorsey is a Chase Daniel backer. What I believe is he’d like a proven starter to play a year or two, or until the quarterback they choose high in the draft this year is ready to play. And who knows? Desperation may make Dorsey and Hue Jackson turn to Daniel. I would think that would be a pretty desperate move, if it comes to that. Really nice of you to say, Brandon. Like I’ve told those who don’t like me going far afield in the column, I average probably 7,000 to 7,500 words a week on football throughout the year. If you don’t like the 500 words or so on all other aspects of life I throw into the salad, they’re easy to skip. all the way to the ending.